The 2018 Macao International Environmental Co-operation Forum and Exhibition (2018MIECF) will be held from April 12 to 14, with the theme “Shaping of Eco-Cities for Inclusive Green Economy”. The event is organised by the Government of the Macao Special Administrative Region (SAR) and takes place at the Cotai Expo in the Venetian Macao Resort Hotel. 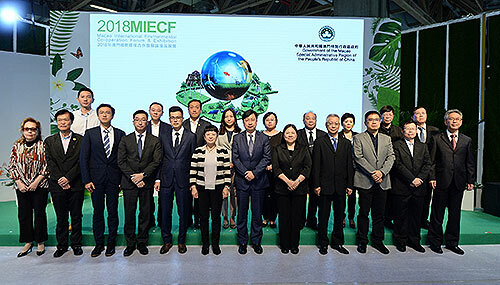 In line with national policy and making use of Macao’s unique competitive advantages, the 2018MIECF continues to serve as a ‘green platform’ for exchanges and co-operation in the environmental protection sector. More than 490 exhibitors from 19 countries and regions are taking part in its “Green Showcase”. Additionally, the 2018MIECF “Green Forum”, as in previous editions, remains its important role in promoting regional-level exchanges of information in the environmental protection sector. The “Green Forum” offers a total of six panel sessions and a special session, with an aggregate of more than 50 speakers from various countries and regions, to discuss the latest issues in the international environmental protection domain. The 2018MIECF is supported by the National Development and Reform Commission of the People’s Republic of China, the country’s Ministry of Science and Technology, Ministry of Industry and Information Technology, and Ministry of Ecology and Environment; co-organised by the provincial and regional governments of the Pan-Pearl River Delta Region. The Macao Trade and Investment Promotion Institute and Macao’s Environmental Protection Bureau act as co-ordinators for the event. The 2018MIECF marks the event’s 11th edition. The event is positioned in such a way to link up the green enterprises from countries and places along the Belt and Road, the Pan-Pearl River Delta Region, the Guangdong-Hong Kong-Macao Greater Bay Area, the Portuguese-speaking countries and European countries. The event has been recognised by the Global Association of the Exhibition Industry (UFI) as a “UFI Approved Event” since 2011. MIECF also received the Macao Convention and Exhibition Association’s “Excellence Conference and Exhibition Award” in 2017. The “Green Forum” is one of the major highlights of 2018MIECF. It takes place on April 12 and 13, and includes six panel sessions and one special session, in which prominent experts are to discuss the topics related to environmental protection. The organisers are honoured to have the renowned international expert on global climate change, Ms. Christiana Figueres, as main keynote speaker for this year’s event. Ms. Figueres is currently the Vice-Chair of the Global Covenant of Mayors for Climate and Energy and a ClimateWorks Foundation Board Member. She was Executive Secretary of the United Nations Framework Convention on Climate Change (UNFCCC) from 2010 to 2016. During her keynote speech at the 2018MIECF opening ceremony, Ms. Figueres is to talk about the current direction of the global environmental protection sector and about sustainable development, while also focusing on the latest trends related to eco-cities and the green economy. She will also take part in an interaction session with the attendees on the afternoon of the second day of the event (April 13) and discuss how to put an end to cities’ reliance on carbon-intensive economy and consumption by promoting economic transformation. This year’s “Green Forum” is joined by more than 50 speakers from the field of environmental protection, including experts, managers from multinational firms and policy makers coming from different countries and regions such as Mainland China, Australia, Costa Rica, the Netherlands, Portugal, Singapore, the United States, Hong Kong and Macao. The two-part panel session on “Sustainable and Resilient Eco-Cities – Key Challenges and Opportunities” takes place on the morning of April 13. The first part, titled “From Design to Reality – Exploring Eco-Cities Case Studies”, focuses on strategies and policies that are able to support the development of sustainable and resilient eco-cities. Mr. Li Jun, Deputy Division Chief of the Ministry of Ecology and Environment of the People’s Republic of China, is the session’s keynote speaker. In the second part of the session, Dr. Ouyang Zhiyun, Director of the Research Center for Eco-Environmental Sciences of the Chinese Academy of Sciences, has been invited to give a talk on the “Relationship between Green Buildings and Eco-Cities”. Another highlight of the 2018MIECF “Green Forum” is the panel session on “Green Finance Innovation to Achieve Sustainable Development”. It is co-organised by the MIECF organisers and the Monetary Authority of Macao, and features a number of top-level international experts on “green” finance. Dr. Ma Jun is this session’s keynote speaker. Dr. Ma is the Director of the Center for Finance and Development at the National Institute of Financial Research of Tsinghua University, Chairman of the Green Finance Committee of the China Society for Finance and Banking, and Co-chair of the G20 Green Finance Study Group. His participation in the “Green Forum” ushers in greater value to the “Green Forum” for the environmental sector. In the “Pan-Pearl River Delta Region Session” on April 13, Mr. Jiang Xiaoting, President of the Environmental Scientific Society of Sichuan Province, is delivering a presentation on the results of his recent business trip to Portugal and Germany – aiming at learning more about the local environmental protection projects – as one of the delegates from the Pan-Pearl River Delta Region. During this session, representatives respectively from the China Association of Environmental Protection Industry, Guangdong Environmental Protection Department, and Jiangxi Provincial Environmental Protection Industry Association, are delivering presentations on the needs of the environmental protection sector in their respective provinces. They will also conduct discussion with the representatives from European countries – namely Portugal and the Netherlands – about the use of “green” technologies in their home countries. The goal of the session is to promote multilateral exchanges and review opportunities for collaboration in the field of environmental protection, in order to boost trans-regional co-operation. The two-part “Green Business Co-operation Day” takes place on the afternoon of the first day of 2018MIECF (April 12). It comprises a “Green Business Forum” with two panel sessions, and an agreement signing ceremony. The Forum’s two panel sessions are respectively on “Green Economy – The Sustainable Tourism”; and “New Pattern in MICE Industry under Eco-Cities Model”. The “Green Business Co-operation Forum” aims to promote government, industry, academic and research exchanges and co-operation in environment-related fields among Macao, the Pan-Pearl River Delta Region, and overseas regions. The “Green Chemical Forum – Control and Treatment of VOCs Pollution in Petrochemical Industry” is also featured in the “Green Forum” programme. The 2018MIECF “Green Showcase” has an expo floor area of more than 16,900 square metres, similar in size to last year’s edition. The event has attracted more than 490 exhibitors from 19 countries and regions to showcase products and solutions that curb air, water and soil pollution, and build eco-cities. In order to facilitate the promotion of environmental protection and the sustainable development of the Guangdong-Hong Kong-Macao Greater Bay Area, this year’s “Green Showcase” includes a new display area for environment-friendly concepts originating from the Greater Bay Area, with a view to boosting the environmental co-operation within the Greater Bay Area. “The Green Showcase”, as in previous editions of MIECF, includes several themed areas, including: the “Showcase Area for Innovative Environmental Protection Technologies”, the “Green Construction Pavilion” which showcases environment-friendly construction products and services, and the “Showcase Area for Green Transportation”, featuring a number of options for sustainable transportation. This year, the organisers have invited procurement representatives of governmental departments and other professional buyers – particularly those who are engaged in highly polluting industries and entities which have pressing demand for environmentally friendly services – from the neighbouring cities in Mainland China and from countries covered by the “Belt and Road” initiative. There are a great number of business-matching sessions taking place during the event. The 2018MIECF specially arranges a “Business-matching Session on Environmental Cooperation in the Guangdong-Hong Kong-Macao Greater Bay Area”. Addressing the participants’ demands and positive remarks in the last two editions, the organisers are again holding a “Business-matching Session on Government Procurement” to enable effective interaction and communication between the exhibitors and government departments. A one-on-one meeting session between representatives of the Pan-Pearl River Delta Region and suppliers of “green” technology from the European Union is also arranged to facilitate exchanges on regional environmental issues. Visitors to the 2018MIECF can make use of the “Online Business Matching Service Platform” (http://bm.ipim.gov.mo/) on the official website of the Macao Trade and Investment Promotion Institute, in order to search the availability of environmental co-operation projects and have a better understanding of potential partnerships. During the “Green Public Day”, on April 14, the organisers are offering a variety of activities mainstreaming environmental protection, including games for families and exhibitions on waste reduction and recycling. In order to encourage “green” transportation practices, free charter buses are operating on four routes, travelling between the MIECF venue and the city centre, the northern district and Taipa during the “Green Public Day”. For more information, please visit the 2018MIECF official website: www.macaomiecf.com. Complimentary parking at the MIECF venue is also available at Exhibition Hall D of the Cotai Expo in the Venetian Macao Resort Hotel. Car parking spaces are limited, and they are available on a first-come, first-served basis. The organisers encourage the whole community to take part in the “Green Public Day” of 2018MIECF, and to bring friends and family members, in order to experience this international event on environmental protection.